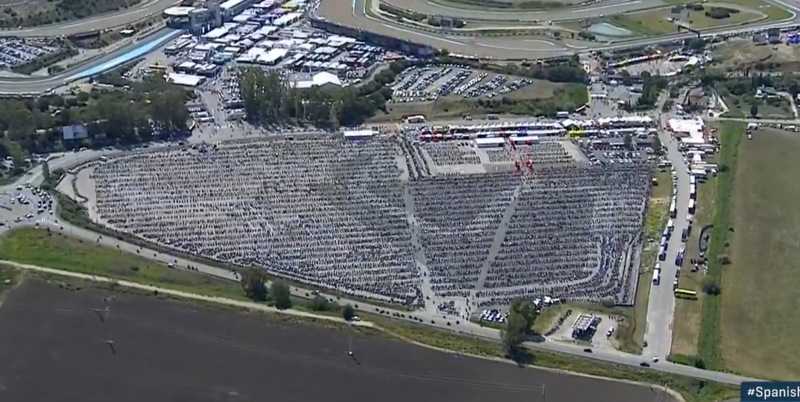 Crowd was estimated at 120,000 for the race at Jerez in Spain this week. Here's a heli screenshot of the parking lot. Apparently everyone in Spain rides their motorcycle to these races. Trying to imagine what it's like looking for your bike in that parking lot. Last edited by xeris; 05-12-2017 at 05:59 PM. Hey my key doesn't work, oh wait, it's not my bike. Worlds largest bike domino fall. I lived near Jerez for 4 years. Never made it to a race. I'm an idiot. I did drive by the track once when a race was happening. It was loud. It's an issue I'd more than be willing to address if I had the good fortune to be able to attend that or any European MotoGP race and/or World SBK race. Heck, or even make it a US MotoGP or World SBK race. I went to Indy 4 or 5 times but CA and TX are a long ride from Skokie (if I had the money and time). At least Road America is close and the US SB racing has finally improved a bit! Have been seriously considering traveling to Laguna Seca for WSB in July. Never been to an event like that and time is running out. Biggest concern is the length of low desert I have to travel to get to sane temps. Anyone know what the camping conditions are like at the track? In years past camp sites were booked a year in advance and hotels/motels similarly, and then they'd unilaterally cancel your reservation so they could book it to someone else for 3 times their normal rate you had. Didn't even consider that the camping would be filled years in advance. I still live in the 70's-80's where you could show up and expect to be accommodated. The closest place that I have an offer to stay is a little over 200mi. south. Going to have to rethink this. Really would like to attend a world class event at a beautiful venue like Laguna.